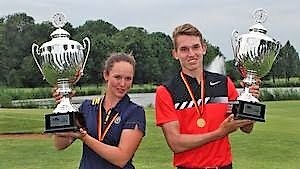 Rain hit the final day of the German junior championships at St Leon-Rot Golf Club today and eventually it was decided that the final results would be declared on the first 36 holes because not all the girls completed their final 18 holes today. The boys, due to start after the girls, did not play any holes. And so, Linn Grant (Sweden), whose grandfather is James Grant from Inverness, who won the Scottish boys championship in the late 1950s and later became a club pro in Sweden, was the winner with rounds of 66 and 68 for 134. Emma Spitz (Austria) finished second with 66 and 69 for 135. England's Annabel Fuller was placed third with scores of 69 and 67 for 136. She won a card countback against two other players who finished on 136.